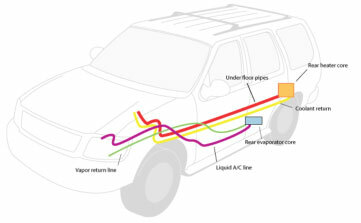 DENSO Air Systems pipes, tubes and hose assemblies fit a wide variety of vehicle applications. All of our products are made from aluminum alloy using 3003 and 6000 series material. Tubing diameters range from 8mm to ¾”. Accessories on assemblies range from insulation to switches, connectors, clips clamps, service valves, sight glass and caps. 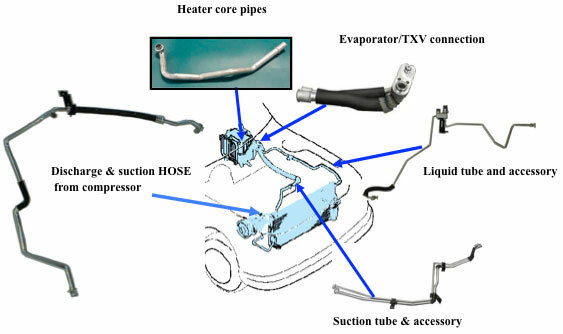 We also offer vehicle under floor pipe & hose assemblies connecting heater and A/C systems from the engine compartment to rear heater cores and evaporator units used in SUV’s, vans and trucks.